Pitch Side Advertising Hoardings are a great way for sports clubs to generate some additional income from their sponsors. Sponsors will usually pay a premium for Pitch Side Advertising Space as this is the area which receives the most attention and reach, especially if the match is being televised. At Lavastar we specialise in Pitch Side Advertising Boards for Football grounds, but we have also worked with Rugby and Golf clubs on their focus point advertising. Lavastar are a leading supplier of Pitch Side Advertising Hoardings for Football Pitches nationwide. Indoor Advertising Boards do not need to be as robust as Outdoor Advertising Boards as they do not need to withstand any harsh weather conditions. Therefore, we would usually recommend a Printed Correx Board System as Correx is a lightweight yet rigid material which is extremely cost effective to produce. Outdoor Advertising Boards on the other hand do need to be able to withstand strong winds which is why we would usually build a weighted wooden frame and then clad the frame in Printed Dibond Sheets. The frame can be weighted using either heavy duty sandbags or a spike-in-ground system depending on the positioning and lifespan of the frame. Dibond is an Aluminium Composite Material which is far stronger than Correx and less susceptible to weathering which will provide a long-term and professional finish. Lavastar can design, produce and install Pitch Side Advertising Hoardings all under one roof meaning you benefit from the fastest possible turnaround times and a truly personal service. All of our Pitch Side Advertising Boards are printed using state-of-the-art printing equipment with high quality inks to ensure that your Advertisements will last as long as needed without suffering from any UV damage. 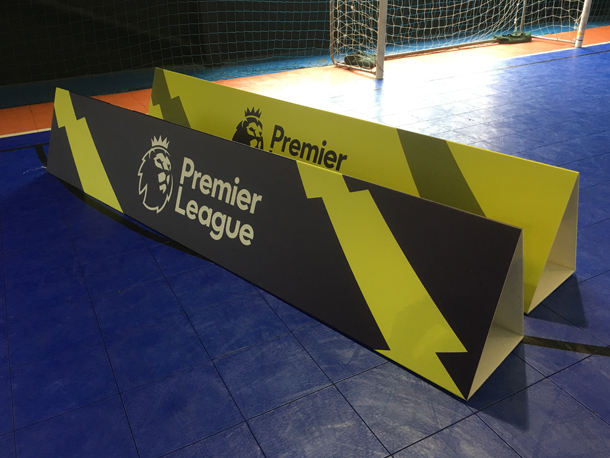 Lavastar can install and dismantle Advertising Boards for short term events such as tournaments or install framework and update advertisements on a seasonal basis to suit league clubs. If you are interested in Pitch Side Advertising Hoardings or any other form of Sport and Stadium Signage for your sports club, please don’t hesitate to contact us today on 0845 459 4525. We would be happy to offer advise on the various Pitch Side Advertising options available to you and will conduct a full survey free of charge so that we can advise on the best solution to fit your budget.